Easy tips for freezing green beans grown in your home vegetable garden. 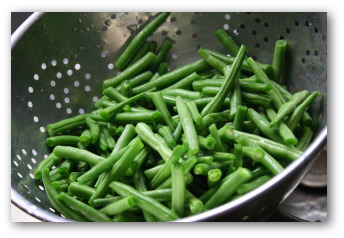 Learn how to prepare, blanch and freeze garden-fresh green beans for great tasting results. Also included below is a delicious recipe for String Beans Plymouth Style! In addition to canning family favorite vegetables grown in the garden, another great idea is freezing some of your extra produce to keep on hand year round. One pound of harvested green beans yields one pint. One bushel or 30 pounds of green beans yields 30 to 45 pints. 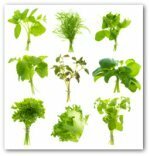 Top quality natural colors, and flavors are preserved best by blanching and freezing vegetables. Preparing vegetables for the freezer is relatively easy as it is not much different from preparing them to serve at a meal. 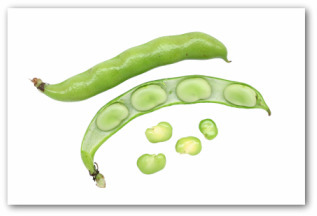 Snap or green beans may be green, yellow, or purple-podded. 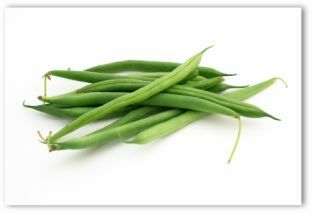 Although, the vegetables are usually eaten fresh, frozen green beans are best when they are very young. Freeze freshly picked beans before they form a tough skin that must be peeled off. If more mature beans are being processed, count on first blanching, then skinning them before freezing green beans. In preparation for freezing green beans, wash beans. Snap off ends and sort by size. Prepare vegetables by cutting or breaking into 1 ½ pieces, or leave whole. Blanch 3 to 4 minutes. 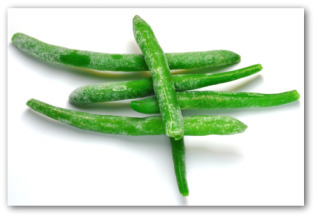 When preparing to serve frozen green beans, cook 12 to 18 minutes for whole beans, 5 to 10 minutes for sliced. Savory, known as the "bean herb" is a favorite seasoning for green broad beans when frozen. Plant breeders have virtually eliminated the strings that gave snap or green beans their common name of "string beans". However, plant breeding has not cut down on the vast number of the varieties of beans you can grow. There are long, thin beans, wide, flat ones such as Italian and the purple-podded 'Royalty' variety that turn green as they cook. 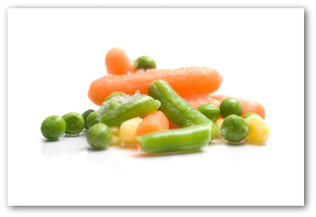 Frozen food should be used before it reaches the limit of its storage time. Keeping an inventory assures eating food at its best. List the number of packages of each batch of vegetables or fruits put into the freezer, with the date of freezing. When removing foods for use, take those with the earliest dates. Do not forget to check used items off your inventory list! Many cooks prefer freezing green beans to canning them. Among the most nutritious of all vegetables and especially good when young, are green soy beans. Only the larger home garden is likely to have space for this crop, but a row or two would afford you at least a tasty sample. Be sure to pick them before the pods turn yellow. Freeze them using the following special preparatory technique: Blanch them in their pods for about 5 minutes before trying to shell them. Then cool them enough to handle. Shell, rinse, and proceed with freezing green beans. Once stored, cook your frozen green soy beans in the same fashion as green limas or peas, allowing enough time for them to become tender. Season them simply with salt, pepper, and butter or savory. After freezing some of your home-grown green beans, you may want to try the excellent recipe below. These unforgettable beans are equally delicious served hot or cold and can be reheated without suffering taste. Serves 4. Thaw frozen green beans. Cook in as little unsalted water as possible in a covered saucepan. Drain and add butter, cream, sugar, salt, and pepper to taste. 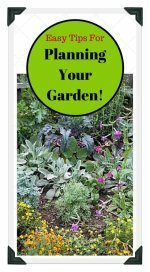 Freezing some of your green bean crop is the answer to enjoying fresh vegetables long after your garden has been tucked away for the winter months!